As evidenced by my recent posts, I went on a baking bender this weekend. I blame it mostly on the weather, which was cold, dreary and drizzly. When it's gloomy out, nothing makes me feel more cozy than a good session with my KitchenAid, especially when Tour de France and World Cup are on TV. I also happened to have three pounds of gorgeous organic cherries from the Farmers Market, and some new toys: a cherry pitter and a heart-shaped pocket pie mold that I got on sale for $4.99. 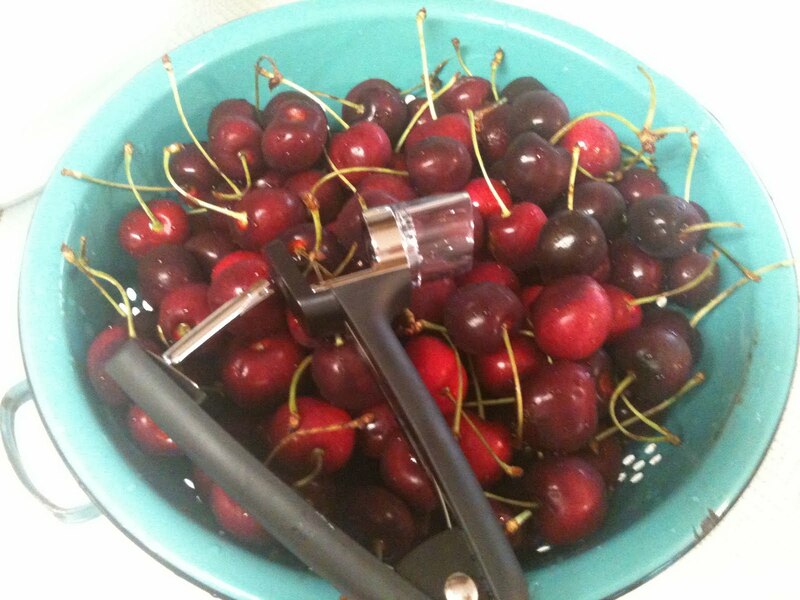 The cherry pitter is brilliant. It's one of those gadgets that seems unnecessary and indulgent until you have one, and then you wonder how you lived without it for so long. It helped me to turn a colander of cherries into pie filling in minutes. 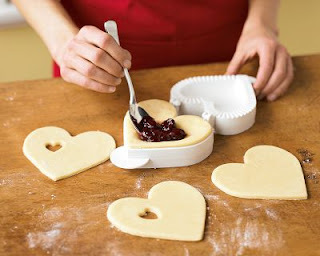 The pocket pie mold, however, was a bust. (I returned it to the store yesterday.) 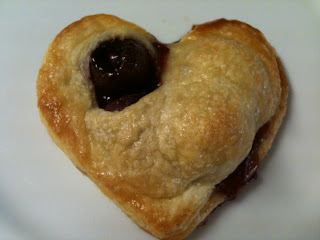 It's a cutter/mold combo: it cuts heart shapes out of your crust, which you place in the mold, fill, and crimp shut. Williams-Sonoma makes it look easy breezy beautiful. 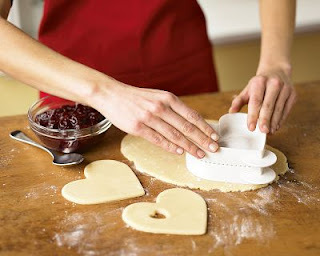 Problem is, the crust hearts should be at least 1/2-inch larger than the mold, which is concave. So when you add the fillilng, the crusts sink into the mold and don't crimp together. Sure, I could have cut larger hearts using the mold as a guide, but doesn't that defeat the purpose of the gadget? And the pie-crust-to-filling ratio was completely off. I could barely fit two tablespoons of filling into each pie, and a cherry would inevitably pop through the little heart cutout like an angry, bloodied olive. So I did the only reasonable thing: I ditched the useless gadget and baked a full-size pie. Below is the recipe for the filling, adapted from here and there, but mostly from Cook's Illustrated's The Perfect Recipe. 2. 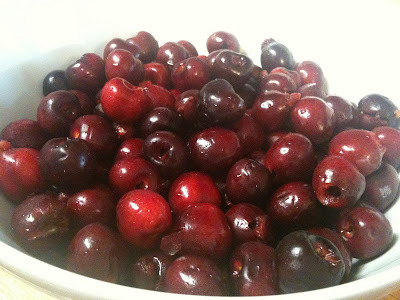 In a large bowl, combine the cherries, sugar, salt, starch, and flavorings, toss to combine thoroughly, and pour into the prepared pie plate. 5. Remove the pie from the freezer or refrigerator, place on a baking sheet, and bake on the center rack of the oven at 425 degrees F for about 25 minutes, or until crust is lightly brown. Reduce heat to 400 degrees F and bake for another 20 to 30 minutes, or until the filling is bubbling and the crust is browned and cooked through. 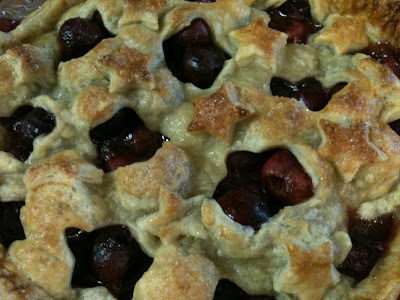 (Rotate the pie if it's browning unevenly, and tent with foil if it's over-browning at the edges.) Remove to a wire rack to cool. Serve warm or at room temperature. so pretty! I can't believe its cold there. Its bloody hot here. Baking is not that fun right now. But making protein ice cream is!